Najam Sethi is an award-winning Pakistani journalist and media personality, editor-in-chief of The Friday Times, star of the popular television current affairs show “Aapas ki Baat” and the recipient of three international press freedom awards. His deep understanding of world affairs and his stellar career, interspersed with a fair share of controversy, has earned him a lot of respect and admiration in Pakistan and internationally. 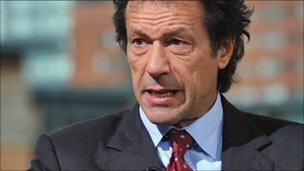 On 31st October, the day after the PTI rally at the Meenar-e-Pakistan in Lahore, in which Imran Khan drew a crowd of supporters, admirers and fans estimated to number around 100,000 people, Najam Sethi appeared in his regular slot on Geo News and, predictably, devoted the entire show to an analysis of the event and of Imran Khan as a potential future leader of Pakistan. On 4th November, in last Friday’s edition of his newspaper, Mr Sethi once again expressed his views about Imran Khan in his editorial entitled “Prince who would be King”. Mr Sethi started by congratulating Imran and, in particular, his young supporters. References were made to a previous show in which he had predicted continued growth in the popularity of the former Pakistan skipper. This replay of past predictions by Mr Sethi, which have since proven to be correct, is a regular feature of the show and is designed, I imagine, to lend credibility of those forecasts that he is about to make next. As is normal, Mr Sethi chuckled sheepishly with humility, while Muneeb Farooq, the presenter of the show, congratulated him on having been right yet again(!). What struck me immediately as I watched this opening exchange between Mr Sethi and Muneeb, was how pointed the reference to “young supporters” was. As if there was an implication that the older (and, therefore, more mature) generation was not part of the masses that turned out to show their support for Imran. This assertion (if indeed it was one) did not seem accurate as there were clearly tens of thousands of older ladies and gentlemen from all walks of life, cutting across social and economic backgrounds, cheering and raising slogans with the best of them. So, I thought, why did he try to make that point? In any case, the show was quickly moving on and I had to abandon that train of thought to keep up with it. 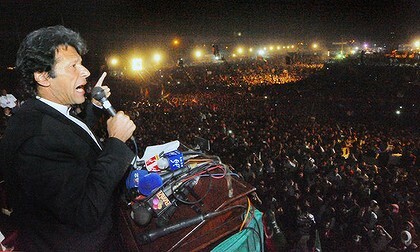 They then moved to a comparison of the PTI jalsa with the legendary rally at the same venue in 1986 by Benazir Bhutto. Mr Sethi dismissed the comparisons; it was BB’s first rally, he says, she was young and charismatic, while Imran has been struggling for 15 years, and is past his 60th birthday. If he had the magnetism that the young BB did, claims Mr Sethi, Imran would not have had to wait for such a long time to capture the public imagination. To me, the message seemed to be: how can you compare this tired old loser, with no personality, to the charm and the appeal of BB when she was young? “Come on,” I thought, “Not fair!” BB had the whole weight of the Bhutto legacy, the whole force of PPP jiyalas, the entire substance of a generation of political significance and the blood of a martyred father behind her. So what if he’s old and has had to struggle? Imran’s a relative newcomer to the political arena compared to the decades of roti, kapra aur makaan. In fact, his persistence and his belief in himself add to his appeal as a leader. As for magnetism and charisma; Imran has oodles of both. Here is where I started to realise that the tone of this show was going to be different from all the others that day. Here is where some contrary opinions were going to start to come through. “This could be interesting,” I thought, and turned the volume up a bit. It’s always good, when the emotional hype dies away, to hear a different view or two, particularly if they offer a sense of perspective. The reason, Mr Sethi asserts, that Imran is so popular now is the failure of both the PPP and the PML-N. It is their negative image, based on their inability to make any positive difference to the lot of the new generation of Pakistanis, which causes these young people to see Imran as the messiah. This generation, he adds, does not know BB’s and Zulfiqar Ali Bhutto’s history, but they do know that in the last 10 years unemployment, economic decline, inflation, the energy crisis, crime, corruption and the destruction of national corporations has been the legacy of these incumbents. Asif Zardari and Nawaz Sharif, he explaines, are seen as “spent cartridges”, and now this generation, in the pursuit of “change”, wants to give Imran Khan a chance. They don’t know exactly what they would like to see changing, but they know that they want change. As I heard this, and thought through the implications, the message I heard was that the popularity that Imran has garnered is not because people know or agree with what he stands for, or because they have been impressed by the PTI’s policies or their roadmap. It is only because they are sick and tired of all the “conventional” players and their track record that, almost by default, because he happens to be around, they have rallied behind Imran Khan. In my view, that is message is misleading in two ways. One, it does not give sufficient credit to the people of Pakistan (particularly given the cross-section of society that was in Minto Park) to assess, at least a high level, whether or not they agree with Imran’s vision of what he wants the Pakistan of the future to be; a country where rule of law prevails “through credible democracy, transparency in government and accountability of leadership” [quoted from the “Our Ideology” page of the PTI website] I think that Mr Sethi will find that most Pakistani’s know, understand and (most importantly – and this is the key differentiator from other leaders) trust Imran when he says that his vision is of a corruption-free Pakistan, where voter lists are complete and authentic, where political leaders are accountable, declare their assets and pay their taxes and where government ministers’ energy is expended on improving the lot of the country and its people rather than on increasing personal wealth. Two, I think it is unfair to paint Imran as the opportunist who is benefitting from the disenchantment of the young generation by using his star-power to promise them an abstract dream of “change” and whipping up a frenzy of unrealistic hope and aspiration that is already doomed to be dashed on the rocks of real life, even if he does manage to become Prime Minister. Firstly, Imran appeals to Pakistani’s of all ages, not just the youth. His supporters cut across all sections of society, all ages, all sects, all ethnicities, men and women, young and old, alike. The Lahore jalsa has demonstrated that better than anything else could, but if further evidence is needed, look around you, ask your friends, your colleagues, your family members, your business associates, your cook, your driver, your watchman, your maid. Nine out of ten will tell you, “Imran is a good man, all the rest are thieves,” or words to that effect. Secondly, there is a fifteen year political struggle behind him; a journey that has taught him a huge amount, through mistakes that he has made, through betrayals and through many trips and falls, he has learnt tough lessons that have made him a stronger leader, a cannier politician and a better man. 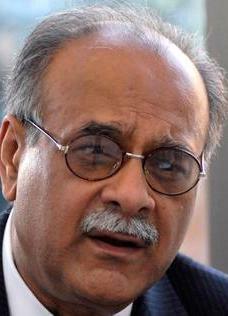 My intention is not to criticise Mr Sethi or to attribute any ulterior motives to his analysis. I am merely considering his opinions, taking into account the manner in which they were expressed and, in the light of what I know and have observed, am forming my own. There was a lot more in that episode of “Aapas ki Baat” and I will be putting more of my thoughts together. For now, I will chew on it, read more of the PTI manifesto and will be back with another installment over the weekend. Look out for Part 2 and please give me your feedback and share your views. Very nicely done piece Mr. Murad. The analyst in discussion is famous for his special treatment for Mr. Khan. He is proud of his “chirya” which I believe is sitting in the presidency corridors right now. I believe, in stead of analysis, he sends his kind solutions to the president house right from the Geo studios. Thank you very much, Madah! I appreciate your feedback. As to Mr Sethi and his little “birdie”, I don’t know where it lives, but its track record is pretty impressive, so I suspect he has some very reliable & high ranking sources to draw upon. That’s what makes his TV show so interesting. But I do agree with you that he does reserve some very special treatment for Imran Khan, which I don’t always think is fair. His little “birdie” is no one else but Nargis Sethi. She is a highest level technocrat, who once was famous for having even more powers than our PM. She is very close to the president and off course views/advices are exchanged two ways. Najam sahab is there to set people’s record right by giving his “credible” analysis while helping the other sethi stay close to president. That’s interesting… I knew that he was involved in some controversies before, but I did not know about this. That must compromise his independence, or at least the perception that others have of it, to some extent. I wonder how he manages to stay neutral. I have heard him criticise Zardari and the government, sometimes in very harsh words, on many occasions, so he doesn’t come across as biased. I’m loving every bit of this post dharna frenzy. It has either muted the critics or aggrevated them to new heights. In any case, it is better for us. But very well written piece. Thank you so much! I really appreciate your feedback. And congratulations for being a part of such a historic occasion. To be honest, I don’t view Mr Sethi as a “mukhalif” and I don’t view myself as a member or supporter of the PTI either… yet. I did sense those underlying, unsaid messages in Mr Sethi’s show that appeared to be intended to diminish the significance of what Imran and your party had achieved that day. In many ways, I think that Imran and the PTI leadership ought to welcome criticism and legitimate questions and take the time to respond to them in detail. I am reading the constitution and manifesto of the party these days and, in the most part, I have found it is compelling and sensible. On the other hand, there are questions around the practicality of some of the policy statements in terms of feasibility of implementation, and about others in terms of whether they would succeed in achieving the stated aim. These questions need to be addressed. Also, I’m not sure if the “first 100 days” paper was ever published, as that would really be interesting to study. Thanks again for your kind comments. Part 2 is almost ready and I will be publishing it tonight. Please do read that, if you can make the time, and let me have your feedback on that too.